Back in 2012 Huffington Post reported that two thirds of American households are living paycheck-to-paycheck. Quoting the results of a survey from the American Payroll Association, they reported that 68% of households would find it “somewhat difficult or very difficult if their paychecks were delayed for a week”. Are you one of the majority who can’t go as much as a week without a paycheck? It’s a serous question, especially since job security is now a thing of the past. I don’t think it’s an exaggeration to declare that everyone should have at least a rough idea as to how long they can go without a paycheck as a basic part of their overall financial plan. 4 Moral of the story: be ready to live without a paycheck – at any time! A job loss is usually the first and most obvious cause that comes to mind, but there other reasons that can result in the loss of a paycheck, and some of them can be even more challenging. Illness or injury. It’s tempting to assume this to be a non-problem, since it will generally be covered by disability insurance. But not all illnesses and injuries rise to the level of an automatic disability insurance claim. Even if you do qualify, it can be several weeks – or months – before the checks start coming in. Taking care of a loved one. With people living longer than ever, this is becoming a more frequent occurrence all the time. An elderly parent can sometimes sustain sudden injury or illness that will require hands-on care. You may find yourself in a situation of needing to abandon your job to provide that care. This can result in the disruption of pay for an indefinante amount of time. Starting a new business. It’s unfortunate that one of the main reasons why more people don’t strike out into self-employment is because they can’t afford to miss even one paycheck. But if you do start your own business, it will probably take several months before you begin earning income, let alone a steady one. The longer you can live without a paycheck, the easier it will be start your own business. Making a geographic move. Though it doesn’t happen often, people sometimes have to abandon a job in order to make a geographic move. As mentioned above, the move can come about as a result of needing to care for a loved one. But it can also happen if you were to develop a health condition that required that you relocate to a more favorable climate. Still another possibility is making a job change. There is sometimes a delay between leaving one job and starting another, as well as an almost predictible delay in receiving your first paycheck. 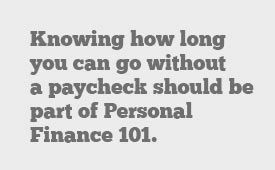 Knowing how long you can go without a paycheck should be part of Personal Finance 101. At all times, you should know approximately what the time frame is. In order to do this, you have to do some simple math. Add up your liquid assets . Add up assets that you have from any sources that you can get your hands on in no more than 24 hours. These will be the most liquid forms of assets that you have. That does not include equity investments, retirement assets, or home equity. We’re talking pure savings here. More on that later. Calculate your necessary monthly living expenses. You probably know what your current monthly budget is, but when you’re contemplating living without a paycheck you have to get more specific. What you need to know are the total of expenses that are absolutely necessary in order for you to survive. This will include basic house payment, essential utilities, debt payments, insurance premiums, and at least minimal estimates for food, gasoline, and miscellaneous expenses. Discretionary spending, like retirement contributions, entertainment and funding your vacation, can be excluded. Once you have these two numbers in hand, divide your liquid assets by your necessary monthly living expenses – that will tell you how long you can live without a paycheck. For example, if your total liquid assets come to $20,000, and your necessary monthly living expenses are $5,000, you will be able to survive for four months without a paycheck ($20,000 divided by $5,000). If your numbers look anywhere near this good, you’re in a better financial position than the vast majority of American households! Generally speaking, financial advisors recommend having at least three months living expenses available if you are salaried, and at least six months if you are self-employed. In adding up your liquid assets, it’s important that you do not include certain asset classes or other sources. Below are some examples, and the reasons why they should not be included. Retirement plans. At a minimum, these should not be considered liquid assets because tapping them would create tax consequences. If your period of unemployment is longer than expected, you could be facing a major tax liability with a greatly reduced income. In addition, you should not use long-term assets to solve short-term financial problems. Investment accounts. One of the problems in liquidating investment accounts – mainly stocks and funds – is that financial emergencies often occur at the worst times for asset prices. If you have to sell stocks to cover missing paychecks, you can bet that it will happen when your stocks are down in price. Once you liquidate them, you’ll be locking in the losses forever. Credit cards. In a society in which people maintain very little in the way of liquid savings, credit cards are often seen as something of an emergency fund. The problem here is that you are raising liquid cash by creating future obligations. They will represent a reduction of income once you are finally re-employed. Home equity line of credit (HELOC). This has the same basic disadvantages of using credit cards, except that it has the added dimension of locking you into very long-term obligations. You will be borrowing long-term to finance the short-term. Family and friends. We sometimes see borrowing from family and friends as a form of “soft credit” (it doesn’t show up on your credit report). But not only are you creating an obligation that needs to be repaid, but you can also be doing long-term damage to important relationships. Once again, none of these should be used to cover a lost paycheck, despite the fact that many people do it all the time. Moral of the story: be ready to live without a paycheck – at any time! Each of these sources represents ready cash. And you can tap them anytime an emergency arises, without creating complications or future financial obligations. No matter what else you are doing as part of your overall financial plan, make sure that you’re prepared to live without a paycheck. It can quite literally happen anytime, and for more reasons than we generally think. Do you worry how you would survive if you were to suddenly lose your paycheck? What strategies are you taking now to prepare for the possibility? Kevin, thanks for writing this one; you just made my day. We can live without a pay for over a year – and only four years ago we were in about $160,000 consumer debt. How things can change when people learn and act :). Hi Maria – Now that’s impressive! I’d say that you can do anything you set your mind on if you can generate that kind of financial turnaround. Most people with that much debt would file for bankruptcy and call it a day. I live by YNAB’s fourth rule: Live on last month’s income. And that is just the money that serves as a buffer in my checking account. I also have a 6-month emergency fund. If I suspect long term issues, I could lower my expenses and probably live off of my buffer and emergency fund for about a year. I had been living for a quite long time without regular paycheck. I had some solutions to that but it was more like earning “pocket money”. I know how I felt then, how miserable I was and not because of all I wanted and I was dreaming about but because I didn’t have any sense of security. I started my new job in May 2013. So far, so good. I’m digging out from some debts but in the meantime I appreciate life, I built a travel fund for this year and I’m still working on building a proper emergency fund. My goal is to have a small one for things like emergencies but in the future I would love to have “unemployment emergency fund”. Baptism by fire! I think that’s how most people come to realize that paycheck-to-paycheck isn’t a workable lifestyle. Give yourself a pat on the back for doing something about it. Unfortunately, just getting a few thousand dollars saved is a huge task for a lot of people, but once you have it life goes easier and you can start making future plans. Hi Stephanie – I’ve heard and read that about entertainers. But in a way, don’t you think it’s excellent training for money management? Budgeting and saving money become a lifestyle, and that’s where we all need to be. Often, the person who has a stable income doesn’t learn that lesson, but it’s a real survival skill. As an actress, I’m always ready to live without a paycheck. As soon as I get work, priority number one is rebuilding my emergency fund to create a cushion for the next time I’m looking for work. Which, depending on the gig, can be in several months or a few weeks. That’s definitely right. 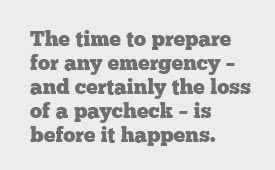 Every one should be prepared mentally and financially when the time comes when he or she can’t earn money any more, especially for those living paycheck-to-paycheck. Great article Kevin! Thanks Mark! I think that even (and especially) if your long term financial plans aren’t where they need to be, you should still be prepared for an income disruption. At a minimum, it will give you the spring board you need to accomplish larger goals. That’s another aspect of short term savings that isn’t fully appreciated. I learned this the hard way! I worked full time for the military when the government almost shut down in April of 2011 and was not at all prepared to potentially stop getting paid! It scared me into saving at least 3 months of income, and working on 6 months next. Hi Heather – It’s sad to say that fear is a greater motivator than prosperity. Consider it a lesson well worth learning, even if it lead to some sleepless nights. We are just at the end of living on one paycheck. What I’ve learned from it is just how lucky we are to be able to get through the last three months without having to dip in to our emergency savings. Before we got our apartment, we decided that we would only rent a place that one of us could afford on their own (on top of their bills). I am so glad we made that decision as we could have easily have rented a place that would have eaten us alive. Hi Michelle – The THEORY is always that “two can live for the price of one” (live on one income, bank the other). In reality, two incomes usually translates to a better lifestyle than either could afford on their own. That’s the beginning of financial ruin, but the course most people take. You did it the right way. 1. Always have several months worth of monthly expenses saved up or at least several months of house pmts saved up. 2. Don’t have your monthly expenses add up to more than what you would have incoming if you lost your job and had only one income(your spouse’s) or had to live on unemployment. These are hard rules to follow and took us a while to get to that point but when my husband got laid off 4 years ago and couldn’t find anything for almost a whole year we were fine! Hi Anita – Umpteen years in the mortgage business convinced me to dole out the advice given in your second point. Most people “max out” their income in order support their desired lifestyle. But if anything goes wrong with that very optimistic assumption, they go from prosperity to suburban poverty in a matter of months or only weeks. If people could grasp that then everything would change. It’s good, old fashioned living beneath your means – which opens the doors to so many other financial and lifestyle possibilities. We had to go through this in 2010 when Rick was laid off and it was NOT fun. Thankfully, in spite of our continued reckless spending, we were still able to pay the bills, but we manage our money much differently these days, working to get out of debt and build a savings so that we’re covered if this ever happens again. Hi Laurie – I’m of the opinion that it’s not bad things happening that matters, but what we do to improve the situation. If you learned from it, it was a good lesson, that forced you to do better. Hi Alicia – Then you’ve already had experience, and know that an income disruption is a real possibility. It seems as if you’re doing what you need to to be prepared, saving cash and paying off debt. Hopefully the worry factor will decline as both the saving and debt numbers improve. This is a big concern for me, as a worrier. I’ve had to take a month off previously to care for a loved one, and so I am very aware of the good reason to have liquid assets. I am paying down debt at the moment, but I still have just under $6,000 in cash because of those mentioned issues. Once I am done with debt-repayment it will get bumped up.